The Washington Post did a huge front-page story about the faltering U.S. efforts to conduct public diplomacy against ISIS, particularly the doings of the Center for Strategic Counterterrorism Communications (CSCC), which was established as a war room to counter al-Qaeda and ISIS online. We, us, taxpayers should be horrified. Much of the article focuses on disputes about the content on U.S. counter-ISIS messaging. One public diplomacy chief, Ambassador Alberto Gonzalez (who I met briefly at a DC think tank thing) wanted to use the kind of grisly imagery that ISIS uses against them. This rankled rankled some and he was retired and his replacements focused on snark. In journalism there is something known as the "inverted pyramid." The biggest most important facts are at the beginning of an article and the details are towards the end. The article on public diplomacy was a bit more a long form piece so in that sense the inverted pyramid was not essential. But there was a sort of inverted pyramid in terms of the focus of the article and the importance of the subject in terms of U.S. public diplomacy. The Media is the Message? Most of the article was about a fight over the content of the U.S. diplomacy messaging. People understand content (because it is meant to be understood - that's why it is content.) Reporters, particularly understand content. But in public diplomacy, as in everything else, there are lots of mistakes, false starts, and blind alleys. If we don't have the perfect response each time, so be it. If some salvos miss, there should be plenty more ammunition. But there isn't. The CSCC is still establishing its organizational culture. It has already cycled through 3 directors (and overall the broader public diplomacy effort is not much better off.) They have a tiny budget and have to fight for office space. When the plan for the CSCC was proposed, President Obama was furious, "This is what I've been asking for -- why haven't we been doing this already?" When the CSCC's first director took office, 9/11 was nearly a decade past. His wife asked, apparently incredulous, "You're doing this now?" I've gone to about 2000 DC think tank things on terrorism over the past decade and a half and at every single one, speakers have discussed the need to "win the war of ideas." But no one seemed to have a clue how to do this. Now, almost 15 years after 9/11, we still don't have a clue. My wife, with her own snark, noted, "Welcome to government." But it only took a year for us to gear up and invade Iraq! The case study on the bureaucratic politics of the failure to build an effective public diplomacy operation after 9/11 should be fascinating. The bureaucratic failures are the subtext to the fight over content. Fine, but buried in the article is the truly crucial detail. Later chair of the House Foreign Affairs Committee Ed Royce added, "If we can't measure the impact of what we're doing, how do we prove it's effective?" This is the buried nugget. We don't know how to do public diplomacy because we can't really figure out what about it we can measure. There is a strategic problem - what can public diplomacy actually do and how do we know if we are doing it? There is also a technical issue: how do we understand and measure online activity to make our efforts effective. A couple hundred twitter users should not be able to drive the goverrnment of a super-power bonkers. And the inability of our government to manage this problem (not necessarily solve it - droning bloggers seems out of proportion) makes us appear ineffectual. These are hard problems with no permanent solutions. But the fact that this is where we are almost 15 years after 9/11 - when the challenge of public diplomacy has been front and center throughout that time - is absolutely ludicrous. Sometimes, one gets to the end of a writing project and realizes that was just the beginning. That is exactly what happened after my review of Sarah Chayes' Thieves of State was posted. It was an excellent book. I have long been interested in questions of development - particularly institutions. The U.S. invested hundreds of billions of dollars hoping to build decent governments in Iraq and Afghanistan. It didn't take. On a smaller scale the U.S. has invested heavily attempting to do the same sorts of thing all over the world - with limited results. Reading Chayes book crystallized the fundamental problem as being corruption. That is the state (and the individuals who staff its institutions) are primarily focused on extracting money. They do this to the exclusion of providing any services. Redistributionist policies don't work because usually the richest people - no matter how wealth they are - do not have enough money to make up for the poverty of others. But what does happen, I'm paraphrasing the Nobel Laureate economist Douglass North, is that the very wealthy control institutions that allow them to become very wealthy at the expense of keeping most people poor. Identifying a problem does not make it any easier to resolve. The U.S. with its relatively efficient and honest bureaucracies defines corruption very broadly. But in many societies the social guts are work by what we would call corruption. But they may be more or less functional webs of obligation - with an equilibrium hammered out over centuries. Finding ways to work with these systems (without falling prey to a corrupt guide) seems essential. I just described pre-modern societies which - by our standards - are corrupt, but are functional. Let's not romantize them. Chayes cites a very deep literature known as Mirrors for Princes, advice written for rules. The fact that so many of them exhort rulers to avoid the temptations of corruption suggest that this is not a new problem. At its core, I recall Aristotle and distributive justice. One is due a certain amount, taking more than what one is due is unjust. Of course the king can be wealthy, but if the second assistant to each minister is also wealthy, than perhaps they are taking more than their due. In my studies, one of my great eureka moments was in studying international economics and understanding the physics of money. Not micro-economics - how our more or less rational pursuit of goods - shapes our behavior in often predictable but also surprising ways. But in macro-economics is more about the shape of money - the way money works changes and can how that shapes behavior. I don't have a great handle on this, but clearly there is a lot going on. Here's my impression. When a modern society engages an undeveloped society it will, merely through contact, drop insane amounts of money on the pre-modern society. Money on a scale this society cannot possibly absorb and that skews whatever equilibrium is developed. If the clans with which the west engages an undeveloped society can suddenly get their hands on millions of Western currency, than their every incentive is to get as much of that currency as possible and ship it someplace safe (Dubai, Europe or where-ever.) Their incentives to maintain the complex web of obligations are shot. Engagement with the West has changed the shape of money. This happened in the colonial period, but the age of modern banking means that the scale and velocity of money moved is far, far greater. 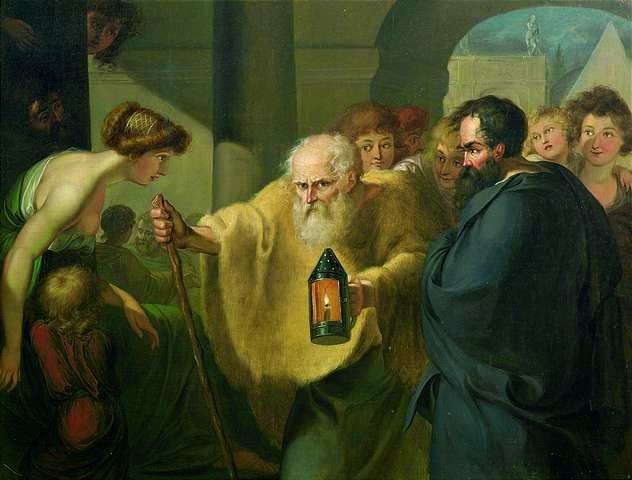 Chayes focuses on the morality of the kleptocrats, but if that's the focus than we will be adopting the foreign policy of Diogenes, hunting for an honest man with a lamp. (Apparently, Diogenes father minted coins and Diogenes was banished from his hometown for debasing currency...huh!) Point is, good luck. Our ability to foster virtue is limited. So Chayes is right that kleptocrats use the modern financial tools and institutions the developed world foist upon the developing world to commit their theft. But her primary policy responses involved legal recourse. Here I think of the baby-sitters co-op: a bunch lawyers on Capitol Hill in 1970s arranged for a baby-sitting cooperative. If one baby-sat another couple's kids they got a coupon they could use to get another family to baby-sit their kids. A good system, but no one wanted to go out in the winter and everyone wanted to go out in the summer, leading to all kinds of hoarding and other sub-optimal economic behaviors - the system wasn't working and no one was going out. Being lawyers, the co-op made rules to get things back on track. But it didn't work, it was an economic problem. When the organizers changed the frequency with which coupons were issued and created opportunities to borrow coupons things got back on track. It was a monetary problem not a legal one. The shape of money.